The Legend of Zelda: Ocarina of Time (TLoZ:OoT) was originally released on the Nintendo 64 system in North America on November 23, 1998. The game was developed by Nintendo's EAD, and of course directly published by Nintendo. 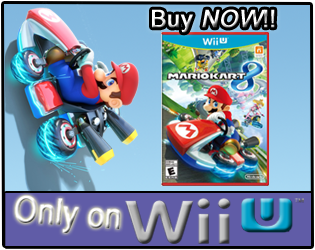 The game had a MSRP of $49.99 when it released on the Nintendo 64, but has since been "re-released" multiple times. The Legend of Zelda: Ocarina of Time was re-released on the Nintendo GameCube as a bonus disc with The Legend of Zelda: The Wind Waker, and then on February 26, 2007, Nintendo released TLoZ:OoT on the Wii's Virtual Console service for just $10. How many hours have Wii owners reported playing The Legend of Zelda: Ocarina of Time on the Virtual Console, since the game released? Let's take a look! The Legend of Zelda: Ocarina of Time has had about 227,654 Wii owners report their play-time data through the Wii's Nintendo Channel, with days reported. 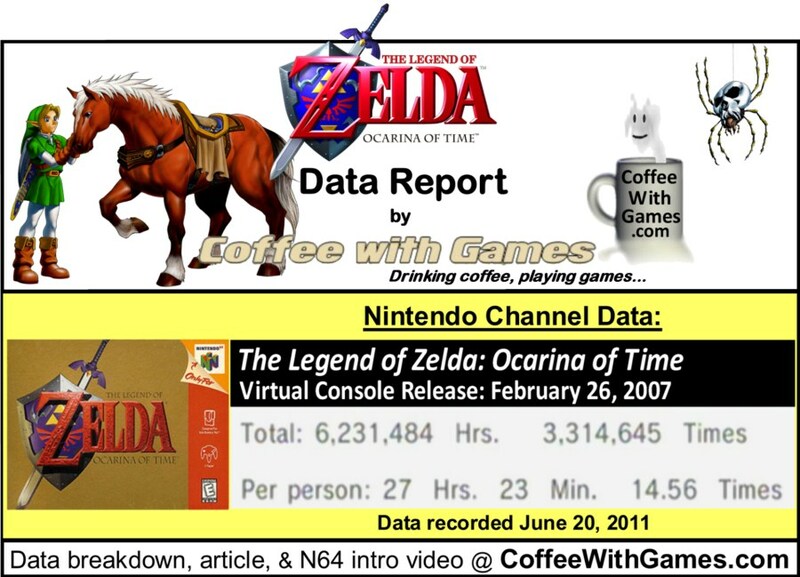 The Legend of Zelda: Ocarina of Time has 6,231,484 Total Hours of game-play reported, with the average play-time being 27 Hours 23 Minutes "Per person" reporting data. The game's average play-time per session is 1 Hour 52 Minutes. TLoZ:OoT is currently listed in the #3 spot in the Virtual Console's "Popular Titles" section, as of checking around 2:00AM on June 21, 2011. The "Popular Titles" section lists the top 20 most popular Virtual Console titles. Not only is the game at the #3 spot, but two other Zelda titles are in the "Top 10" section along with it: The Legend of Zelda and The Legend of Zelda: Majora's Mask. The Legend of Zelda: Ocarina of Time's American Virtual Console version has made Nintendo about $2,276,540(before taxes), based on the approximate number of players that have reported game-play data and the game's $10 price point. TLoZ:OoT's "professional" review score average is 97.48%, based on 25 reviews on GameRankings.com. "Professional" review scores recorded around 2:15AM on June 21, 2011. While I do own The Legend of Zelda: Ocarina of Time for the Nintendo 64, I have not played it in a long time. If you played the game on the Nintendo 64, but have forgotten what it was like, the following video is the brief introduction clip that plays when the game is turned on. WARNING: Flashbacks to the 90s may occur! If you are a Nintendo 3DS owner and have been looking for a "new" game to purchase, Nintendo just yesterday(Sunday) released The Legend of Zelda: Ocarina of Time 3D for the system, which is described as, "a fully re-mastered version" of the original game. As for the reported game-play hours of the Virtual Console version, I think the average hours "Per person" show TLoZ:OoT is being completed at least once all the way through by most Wii owners reporting their game-play data, but not much more than that. Have any of you played The Legend of Zelda: Ocarina of Time on the Nintendo 64, and the Virtual Console? If so, do you think the Virtual Console version is a direct port of the N64 version, or does the Virtual Console version have some things left out from the original N64 version? Also, if you're a Nintendo 3DS owner did you purchase the game on Sunday, or do you plan on purchasing it in the near future? I found the controls a bit wonky on the Virtual Console game. It's been a while since I played it, but the buttons were mapped funnily, I recall. That said, it's still the best darned Zelda game ever. OoT was such a special event for me - I remember playing it for hours and hours and hours as a kid. I find the average play time length intersting - nearly 2 hours. I think that's a testament to how absorbing this game is - once you start playing the time just flies by. If I remember correctly there was a lot of versions for the N64 game. There was different cart versions. Basically there was stuff taken out in the later versions of the game that was in the earlier versions. Ganon coughed up red blood in the earlier versions. This was later changed to green blood. In the fire temple there was this Muslem chant in the Fire Temple that got taken out in the later versions. Those are the ones that come to mind right now. There may be others but I can't think of them now. I always played OOT for the VC with the Gamecube controller. There was some things taken out of the VC version like the rumble for one of the items you get from the Skulltala kids.You actually had to know where the holes were and and where to bomb to make the hole appear. The controls for me were not a problem for me.The item switching wasn't an issue for me. 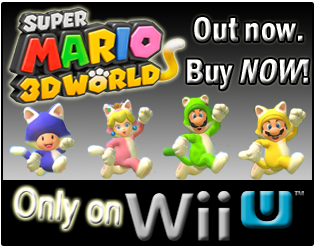 As for the 3DS version I do intend to pick it up but I have to get a 3DS first. Now that Kid Icarus has a release timeframe I do intend to pick up a 3DS. I have it, and they did a great job remastering the graphics. The textures are way better, the characters less blocky, and they even got some brand new art in there. Yet it still looks and feels like the old game. I just wish they had remastered the music as well! I played it on the N64 and was blown away. I still think the SNES one "A Link to the Past" was the best one though. I agree with Charlie, but I am really enjoying the 3DS remake right now. I wonder if they'll ever get something on the 3DS that shows all the game times also. It does give me my time, and I'm at 14 hours so far. I really want to finish the original LOZ [again] and pick up A link to the past before getting to OOT. I picked up the 3DS version since I haven't played the game since I had an n64 way back when. It crazy to think that at the time this game was so revolutionary... but I remember it having a lasting impact and I played the crap out of it. Now I can see the urge to play it constantly has returned and as I've been playing other games all I can think about is beating the next dungeon or planting all those damn magic beans. So yeah the gameplay still holds up :). I never got the chance to fully play a Link to the Past back in the day, so its hard for me to judge which is better since I have too much Nostaligia for OOT. I'd say they both r gewd. "I find the average play time length intersting - nearly 2 hours. I think that's a testament to how absorbing this game is - once you start playing the time just flies by." Yea, I really wonder how the 3DS version will(or would) translate...being that it's a mobile platform, but this game is definitely more a sit and play for a while type game. Interesting about the different versions, as I can't remember ever hearing that, though I don't doubt it. "I just wish they had remastered the music as well!" Haha, I know some other gamers that have said the same thing. Since you're playing it, how long do you find yourself playing the game each time you sit down with it? I really can't recall playing "A Link to the Past", but I think we have downloaded it from the Virtual Console...perhaps one day(maybe). "I wonder if they'll ever get something on the 3DS that shows all the game times also." I would buy a 3DS if they did...for "3D Data Stories", epicness at its best! Same question as earlier, do you know about how long you play the game each time you fire it up? "I really want to finish the original LOZ [again] and pick up A link to the past"
"I picked up the 3DS version since I haven't played the game since I had an n64 way back when." Haha, yea, when I fired up my copy of OOT to capture the video, I was like, "Wow, I remember this!" Like the others I asked, are you finding yourself playing for about 2 hours at time, or in shorter spurts? Thank you all for the comments/feedback on the game. I hope the 3DS owners playing OOT 3D continue to enjoy their play-time with the game as well! If anybody else has any feedback/comments, feel free to jump in the conversation. @coffee, At first I was only playing in about 30 minute chunks due to my commuting habits, but the farther I get the longer I want to play the game... right now my play time says 1:02 apt. Total 16 hrs.. number 1 game on my 3DS atm.